Land of the Lustrous is a gorgeous trainwreck, the kind of manga that doesn’t make sense on a panel-by-panel basis, but ravishes you with artwork so beautiful and strange it’s hard to look away. I’ll be honest: I read the first volume three times, and found it almost impenetrable. As best I could tell, Land of the Lustrous depicts an interplanetary war between two races: the Gems, whose androgynous, humanoid appearance belies their true, rock-like nature, and the Lunarians, who frequently raid Earth, hoping to capture Gems for decorative purposes. (What kind of decorations remains a mystery; my vote is for bedazzled jeans and hoodies.) Since there are only 28 Gems, they’ve organized themselves into “fighter-medic” pairs to defend Earth from the Lunarians. One Gem — Phosphophyllite, who registers only 3.5 on the Mohs scale — is too weak to perform either task, so the group’s leader pronounces Phos their official naturalist, and tasks Phos with writing a history of Earth. You’d be forgiven for thinking that Land of the Lustrous was a satire on the dissertation-writing process, given how much time Phos spends procrastinating and grumbling about the book, but these scenes are interspersed with awkward flirtations, violent combat, and a brief episode in which Phos turns into a cute, sentient space slug. 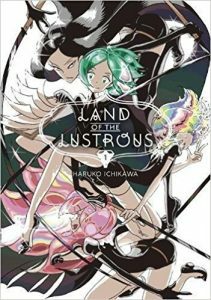 These abrupt shifts in tone frustrate the reader’s ability to get a handle on what, if anything, Land of the Lustrous is trying to say — a problem compounded by the dialogue, which is sometimes so windy that it’s a drag on the story, and sometimes so burdened with exposition that it barely passes for conversation. 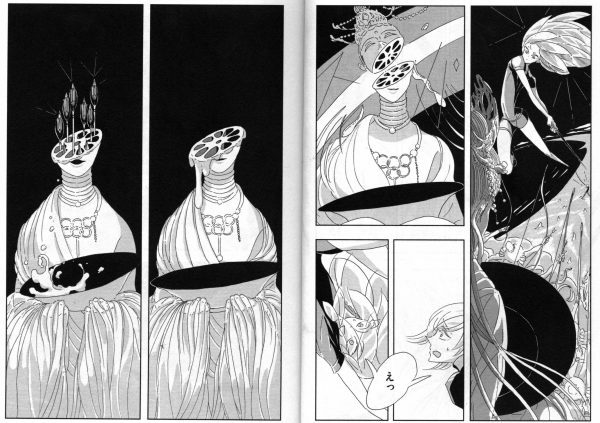 In this sequence, a Gem slices through the general’s head, only to reveal a lotus pod filled with lethal “seeds” — a beautiful but unsettling moment reminiscent of Aubrey Beardsley’s work in its commingling of the sensual and the grotesque; we’re not certain if the Lunarians are animal, vegetable, or mineral. Making this sequence even more disorienting is the dramatic shift in perspective: we see the impending attack from the general’s point of view, then shift to the attackers’ for the moment of contact and its aftermath. The eerie stillness of the final two panels reveals the extent to which the Lunarian general’s transformation has confounded the Gems, who are transfixed by the viscous flow of blood — or is that sap? — from his head. Looking at these images, I wonder what a more assertive editor might have done to reign in Ichikawa’s worst storytelling tendencies: would the tone and pacing have been more even? The world-building more coherent? The dialogue more revelatory? In the absence of such editorial interventions, however, the most original aspects of Ichikawa’s work sink beneath a torrent of banal conversation and stale comic bits that pass for character development. A few moments of unnerving imagery interrupt the tedium long enough to make an impression on the reader, but are too brief and scattered to yield a truly satisfying experience. LAND OF THE LUSTROUS, VOL. 1 • BY HARUKO ICHIKAWA • TRANSLATED BY ALETHEA AND ATHENA NIBLEY • KODANSHA COMICS • RATED: TEEN (13+) • 192 pp. This was pretty much the same experience I had I was all excited when I got it read it and was simply left baffled the dialogue is simply odd and while the art is amazing I can only hope the writing improves in future volumes because as is it is kind of an incomprehensible slog that one is simply thrown into. It sounds interesting enough that I might give it a shot via a library checkout. At the very least, I’m looking forward to seeing the artwork. I don’t know if you saw Sean Gaffney’s review; he found some of it head-scratching, too, but liked it more than I did. Here’s his two cents: http://suitablefortreatment.mangabookshelf.com/2017/07/05/land-of-the-lustrous-vol-1/. I hadn’t, so thank you for the link! Yup, it’ll definitely be a library checkout. While I do tend to prefer things to make sense, this might still work okay for me since I’ll have advance warning about its problems.